KPUN reporter in the field: Today a daring group tackled Abyss 1 and 2! This reporter went along to capture the hunt experience. Led by Connie Crete, we battled our way back from the brink of extinction. 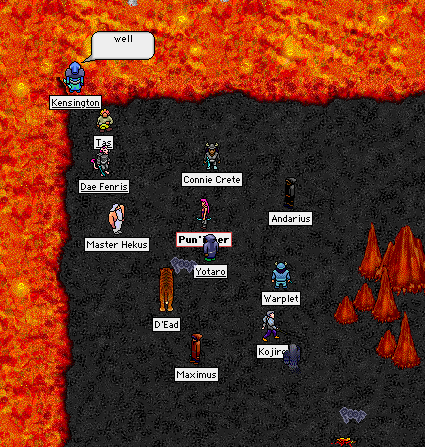 Here is a shot of right before we decided to go to Abyss 2. The aftermath of this decision was too icky to put pix up and frankly, there wasn' t time to get out the camera I got from Kimmel's Department Store. Although it took a while, we eventually went in and kick their abysmal butts. In honor of this great victory, Kimmel's is selling the "I survived Abyss 1 and 2 and all I got was this lousy T-shirt" shirt for just 100c. So what was Master Hekus doing there?? He wandered outta tha liberry after we'd started our abyss mosey. Gived him tha invite ta come along on tha mosey.